Display your military pride with this 12" USMC wall clock with second hand. This clock has a large official US Marine Corps Eagle, Globe, and Anchor logo in the center so you can proudly display your support of the U.S. Armed Forces. 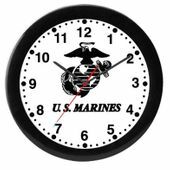 This US Marine Corps clock is perfect for the office, garage, or home.